I am currently on a 3-month elective in Cape Town, South Africa. I’m experiencing an awesome city, sampling a new flavour of emergency medicine, and getting exposed to some regular major trauma (an area of EM I am interested in, but have had minimal experience with so far). ‘If you want to see major trauma, get yourself to resus!’ shouted the consultant on the floor that day. A 16 year-old boy had been brought in by ambulance. He had been assaulted on the way to school, and his most obvious injury was a stab wound to the left anterior chest. As always, details have been modified to protect patient confidentiality. The patient was talking to us and answering questions appropriately – we, therefore, established that he had a patent airway and adequate cerebral perfusion. Examination of the inside of the mouth revealed no blood/vomit/dislodged teeth/foreign bodies. 15L oxygen via a non-rebreath mask was applied and the patient had oxygen saturations of 100%. The patient arrived with no cervical collar on. He denied any trauma to the neck, saying his only injury was the stab to his chest. Distended neck veins in the context of penetrating chest trauma made us highly suspicious of tension pneumothorax or cardiac tamponade. The patient was tachypneoic (RR 30), but maintaining oxygen saturations of 100% on the non-rebreather. The open stab wound was very obvious on the precordium. It was 3-4cm long and slightly gaping. It did not appear to be ‘sucking’ with inspiration (therefore unlikely open pneumothorax). Subcutaneous fat was visible, with minimal oozing blood. There was no chest wall bruising, deformities or flail segments. The patient had symmetrical chest wall movements. Palpation was unremarkable – there was no tenderness or subcutaneous emphysema. Percussion/auscultation were predictably challenging in a chaotic, noisy resuscitation room – but no obvious abnormality was identified. The radiographer was contacted and an urgent portable chest x-ray was ordered. 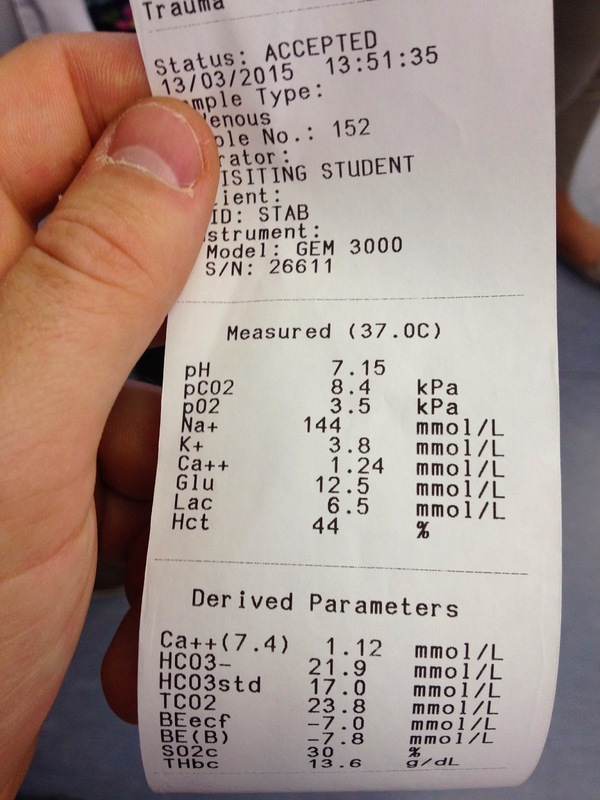 The patient was very tachycardic at 160, and initially hypertensive at 160/110. He was clammy to touch with cool peripheries. There was no evidence of external haemorrhage – the stab wound was not oozing. No abdominal, pelvic or long bone swelling/bruising/tenderness to suggest haemorrhage. Bilateral large bore IV access was obtained. Bloods were sent including FBE, U&E, group and cross match (6 units), coagulation studies and a VBG. A urethral catheter was inserted to monitor urine output. The patient was initially GCS 15. There was no lateralising neurology. The pupils were equal and reactive. There was no evidence of a head injury. The patient was given ample opioid analgesia. On full exposure we found no occult injuries. The EFAST was positive – there was a very large pericardial effusion. In the context of penetrating chest trauma this was blood. What pathologies can be seen? Left haemothorax – Demonstrated by diffuse opacification of the left hemithorax, with visible lung markings through it. This occurs as the blood lies posteriorly with the patient lying supine. An erect CXR would demonstrate a dense fluid level with a meniscus. 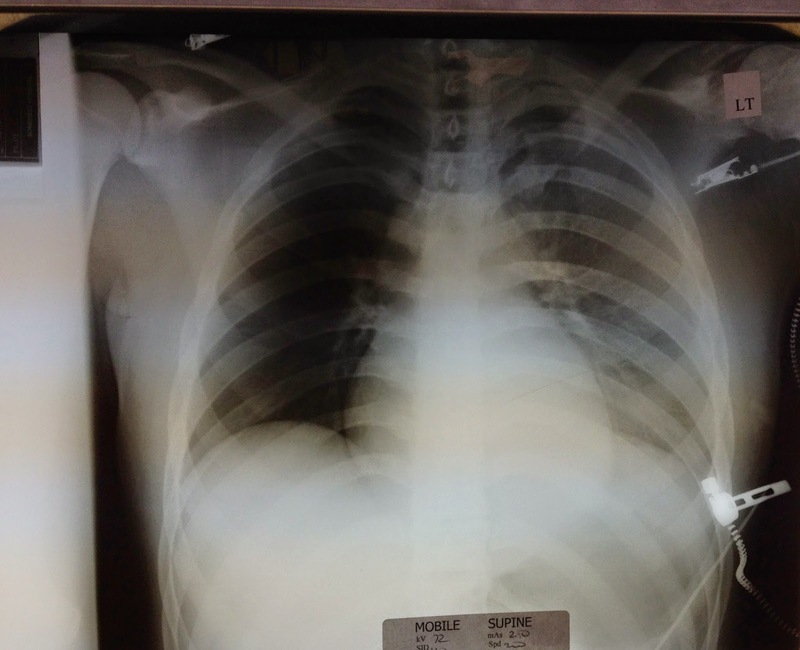 NB: In the supine patient, it may be challenging to differentiate a haemothorax (diffuse opacity) from a large pneumothorax on the contralateral side (diffuse lucency). Pericardial effusion – Demonstrated by cardiomegaly, or a ‘globular’ heart. NB: Don’t rely on CXR to identify pericardial effusion, ultrasound is vastly superior. We identified that the patient had a pericardial effusion and a left haemothorax. 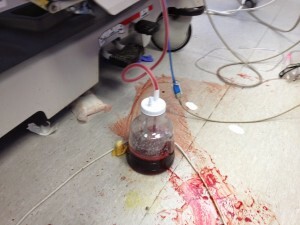 A left intercostal drain was inserted and drained 500ml of blood. The patient’s BP was gradually dropping despite several units of blood products, and it was sitting at 90/60 after 20 minutes of resuscitation. A second look with the ultrasound in the parasternal long axis view demonstrated that cardiac tamponade physiology was emerging. His GCS was falling – eyes were closed and he was making only grumbling noises when prompted. He was moved to theatre after approximately 40 minutes of resuscitation in the ED. Had he arrested in the ED, the emergency physician in charge had the resuscitative thoracotomy equipment at the ready. Luckily the patient held on, his BP was 70/50 before he was transferred. The right ventricle sits anteriorly in the chest, and so is the most commonly injured chamber in penetrating cardiac injury. What is traumatic cardiac tamponade? In the context of penetrating chest trauma, a pericardial effusion can be assumed to be blood in the pericardial sac. Acute traumatic cardiac tamponade describes the haemodynamic compromise that results from the pressure build-up from accumulating blood in the pericardial sac that it restricts the heart’s ability to pump effectively – an example of ‘obstructive shock’. The pressure from the pericardial blood impairs atrial and ventricular filling. This reduces stroke volume and cardiac output resulting in hypotension and eventually PEA arrest if left untreated. 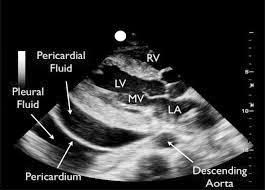 Cardiac tamponade occurring as a result of a blunt injury is exceptionally rare, and non-traumatic causes of the pericardial effusion should be considered in these cases. What are the clinical features of tamponade? Deciphering if heart sounds are ‘muffled’ in a noisy resus is challenging. You may not see distended neck veins in a patient in severe hypovolemic shock. Distended neck veins are also present in tension pneumothorax. Hypotension has a wide differential in trauma. A far more sensitive tool we have at our disposal is bedside ultrasound. There is a pericardial effusion… is there tamponade? The most obvious feature is RV diastolic collapse. Whilst this can be seen in the subxiphoid view (the traditional heart view in EFAST), it’s usually clearest in the parasternal long axis view. The size of the pericardial effusion doesn’t matter. It can be caused by as little as 100ml of fluid in the pericardial sac. Patients with chronic pericardial effusions from non-traumatic causes (e.g. TB, SLE, uraemia, pericardial metasteses) can have a very large amount of pericardial fluid and maintain a normal cardiac output. The guys over at the Ultrasound Podcast describe the appearance of tamponade physiology as ‘a tiny man jumping up and down on a trampoline’ – the trampoline being the right ventricle. In reality, a pericardial effusion confirmed on bedside ultrasound in the context of penetrating chest trauma is a ticking time bomb. If the patient hasn’t gone into tamponade already then it will not be long before they do – definitive management is needed as soon as possible. Is that a pericardial effusion or a pleural effusion? The patient discussed above had a pericardial effusion AND a haemothorax. Often it is difficult to tell the difference between the two with bedside ultrasound. The key to making the distinction is to locate the descending thoracic aorta (DTA), which lies posterior to the heart in the parasternal long axis view. If the anechoic effusion (blood) lies anterior to the DTA (i.e. between the heart and the DTA) then it is pericardial blood. If the effusion is posterior to the DTA then it is pleural. It’s also important to interrogate your RUQ and LUQ views (during EFAST) to assess for the presence of pleural fluid above the diaphragm. How is traumatic cardiac tamponade managed in the ED? In the context of penetrating chest trauma, a pericardial effusion is always blood and will rapidly progress to tamponade. Never forget first principles: Oxygen, large bore IV access, adequate analgesia. Administration of blood products (or even crystalloid if no blood products available) for volume expansion increases the cardiac filling pressures, which temporarily improves stroke volume and cardiac output. However, it is important not to over-resuscitate to a normal/high BP as this increases the rate that blood accumulates in the pericardial sac. Whilst the pericardial sac is the stricture CAUSING the tamponade, it is also PREVENTING the patient from exsanguinating and arresting – it is a balancing act. Ultimately the patient requires definitive treatment – theatre or emergency thoracotomy. The bleeding must be stopped. Pericardiocentesis is not recommended as it frequently fails due to clotted blood in the pericardial sac. How did the patient do? The patient underwent a midline sternotomy and repair of a 2cm incisional injury to the LEFT ventricle (amazingly!). He had a couple more units of blood intra-operatively. Mediastinal and pericardial drains were left in situ. He was extubated day 2 postop. The drains, including the intercostal drain, had minimal output and were all removed on day 3. He was walking around and discharged on day 4. Amazing stuff. What an introduction to EM in South Africa! 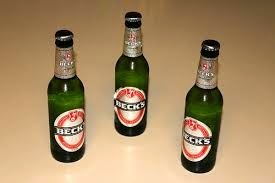 Finally, many thanks to @davefred70 who was the emergency physician leading the resus. He was an exemplary team leader and responsible for a life saved. Hey dude, great case. Thanks for posting. Learned a lot reading it. I'm an EM resident in Canada. I have 2 questions for my own learning. 1) when would you guys intubate this dude. His initial GCS was 15 but dropping with expected decline plus several interventions quickly. His BP was dropping and I fear the intubation / positive pressure ventilation will further drop his preload. I'm debating if it was me when I would bite the bullet and tube him. Did you tube him before the chest tube or only when he arrive at the OR? and 2) how did you best manage his pain to tolerate the chest tube and chest wound with his dropping BP and preload dependence. A combination of morphine or fentanyl or ketamine? Tricky scenerio. Thanks dude and good luck in Africa! KT. Hi mate, glad you enjoyed the post. So we didn't intubate the patient in the ED – his haemodynamics were clearly so fragile and he was adequately maintaining his own airway the whole time he was with us (luckily). We focused on quick, appropriate interventions (analgesia, intercostal drain, blood products), and getting him to theatre as soon as possible where his airway could be more safely managed. Had he started to lose his airway then I guess we would have been forced to RSI, but I'm not sure how well he would have done had that been the case – his haemodynamics were deteriorating fast and he would have probably bought himself an emergency thoracotomy (which the boss was very prepared for). We managed his pain with fentanyl only, and plenty of local for the chest tube! Thanks so much for posting a comment – makes the process of writing a blog so much more rewarding! Thanks for the reply. Great work. Yeah I think the best course of action is just be prepared to take control of his airway and have everything ready during transport but hold off if he's protecting it himself. I find these decisions very difficult so it's good to see how it was handled. If I'm forced to do RSI I'd probably go with Ketamine/Succ. May not even need much or anything at all if he's already down for the count. And be ready with some phenylephrine or even give some before the tube. For pain control I guess I might also consider low dose Ketamine for some dissocation and pain. Probably at 0.5mg/kg or lower. I find it easier to put a chest tube in a dude that's not moving rather than one thrashing about, haha. Great work as usual. Stay safe and have fun! Alright Lloydo! Great blog as usual. Was there a clear defined criteria of when the consultant would perform an emergency thoracotomy prior to theatre (For example systolic BP <60 maybe) or would he have continued to temporise until theatre given at that stage it was probably imminent? 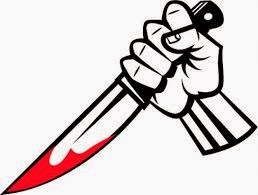 What are peoples experiences with when to pull the trigger and perform emergency thoracotomy (outside arrested patient) in similar situations? Do you know what they used to induce him in theatre? Keep up the good work Lloydo. PS Monty's done a new photo shoot and put it on FB. Dr. Bourne. Cheers for commenting, great questions. In this case, the circumstances were in the patient's favour as theatre was ready for him and there were no anticipated delays. Had there been any delays (surgeon not available immediately for example), then we would have gone ahead with it. As I said in the post, the boss was very ready to pull the trigger. Had the patient arrested on the way to theatre, then we would have made the wrong decision, but he didn't and he survived. We were fretting over whether we had done the right thing after the patient had left the department. LITFL discuss the indications for emergency thoracotomy (http://lifeinthefastlane.com/ed-thoracotomy-is-it-just-the-first-part-of-the-autopsy/) – they say that an SBP of <60 with tamponade is an indication – have a look at their protocol. The ETM course manual says that confirmed tamponade on FAST is an indication, regardless of BP. Every case is different of course. Guidelines/protocols are very useful in these high stakes situations, but individual circumstances and available resources must be taken into account. Would love to hear the thoughts/opinions of some more senior people on this matter. Very tricky. As for the induction drugs used in theatre – not sure. I'll get back to you on that one. Watch this space. Great post Robby! Was awesome meeting you, enjoyed all our chats and hope to visit you in the UK one day!